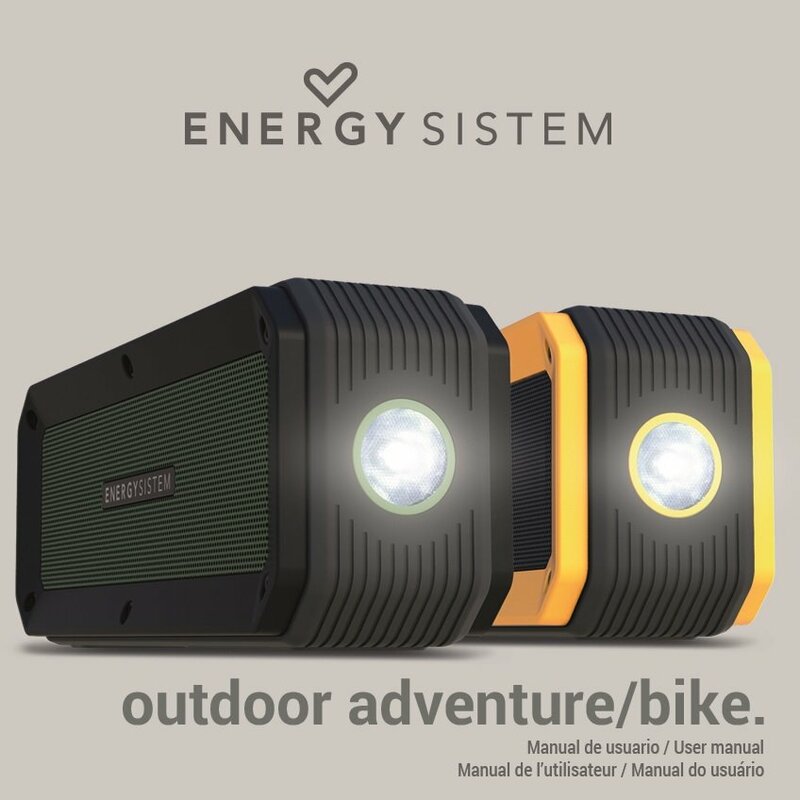 Thank you for your trust in our company and for buying your new Energy Outdoor Box, a portable Bluetooth speaker conceived to let you enjoy your music throughout your everyday adventure. Water-resistant and shockproof speaker with built-in torch. It also plays music from external microSD cards or via Audio-In. Or, if you prefer, listen to the FM radio. We hope you enjoy it. The product is splashproof, not waterproof. Close the cover flap that protects the ports properly when the device is exposed to moisture. The product withstands drops from a height of 1 m. Drops from a higher height or harsh falls may damage the device. Press and hold the On/Off button (1) for 2 seconds to turn on device and you will see that the Function and charge indicator (8) turns on. You will also hear a confirmation sound when switching on the device. Press and hold the On/ Off button (1) for 2 seconds to turn off your device. You will hear a warning sound and the Function and charge indicator (8) will switch off. When the battery level is below 10%, you will hear a sound that will remind you to charge it. Plug the mini USB end of the provided USB cable into the MicroUSB charging port (12) of your Energy Outdoor Box and the other USB end to any device with an USB charging port to provide energy (PC, USB wall charger, car charger, etc) to charge the battery. The Function and charge indicator (8) will turn red and will switch off once the charging process has been completed. The charging time is approximately 3 hours. Press and hold the Change function button (2) for 2 seconds to start the Bluetooth search. At this point, the Function and charge indicator (8) starts blinking blue. Access the list of available devices on your smartphone or tablet and once there, select your "Energy Outdoor Box". The devices will be connected without codes. Once the connection has been established, you will hear a confirmation sound. Control playback from the speaker by pressing Next (6) or Back (4) and Play/ Pause (5). Your Energy Outdoor Box will save the last connected device and will automatically pair with it when you turn on the speaker once again. Press and hold the Change function button (2) for 2 seconds to start the Bluetooth search and pair your speaker with a different smartphone or tablet. When receiving a call, the song you are listening to will stop and the ringing tone will sound instead. Press the Play/ Pause/ Call control button (5) to answer an incoming call and press it once again to hang up. The song will automatically resume afterwards. Keep a distance of 30 and 50 cm from the speaker for a proper voice reception. 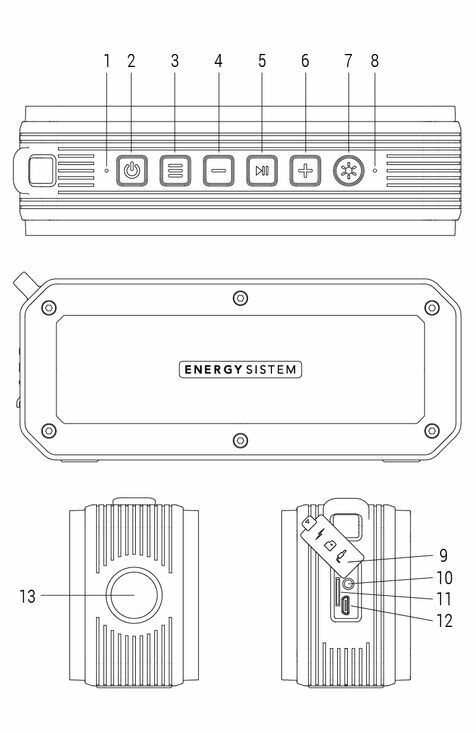 The Microphone (1) is placed behind the front grille of your Energy Outdoor Box. Once the FM radio is enabled, press and hold the Change function button (2) for 2 seconds to start searching for FM radio stations. At this point, the Function indicator (7) starts blinking green. The process may take a few minutes. Once the search has been completed, press Next (6) or Back (5) to select the radio station that you want to hear from all saved radio stations. Plug the mini jack cable (provided with the product) for a better radio wave reception. The product will automatically switch to Line-in mode. You can enable radio mode once again by pressing the Change function button (2) and the cable that you have plugged will act as a radio antenna improving the radio wave reception. Your Energy Outdoor Box will save the last selected radio station when you turn it off and on once again. If you turn off the speaker or remove any storage unit, the internal memory will save the moment when you paused playback. If you connect the same removable storage unit once again, playback will resume and the last song that you listened will be then played. Your Energy Outdoor Box also features a 3.5 mm mini jack input (10) to connect your external devices using the provided audio cable. Important: This warranty does not cover any damage or loss of data stored in warranty products. Therefore, Energy Sistem’s Technical Service will not assume any loss of the above mentioned information. In this respect it is recommended that you make a backup of your data and remove any personal data from the product's internal memory before you send it or send it only with the original data.